NordVPN, like many fellow VPN service providers, is fairly young as a business, and operates in a relatively ‘small’ country where the legislation is more favorable to Internet privacy. (NordVPN started operation in 2012, and is based in Panama.) Yet, it distinguishes itself by offering specialized VPN application solutions. File-sharing (aka bittorrenting or torrenting) is a popular, yet bandwidth-intensive, online application. Multimedia contents – movies, music, games – are uploaded, downloaded and played across the Internet. For instance, Popcorn Time is a file-sharing service that specializes in movies. It finds and categorizes free online movies, and makes them accessible through streaming. While file-sharing apps such as Popcorn Time are darlings to users, they are frowned upon by Internet Service Providers (ISP). Your ISP balks at the bandwidth that these applications consume, so much so that it may throttle their bandwidth. In other words, they may deliberately target and slow down your Popcorn Time usage. You can prevent your ISP from throttling file-sharing bandwidth by using a VPN. When you connect to a VPN, your Internet traffic is transmitted through an encrypted VPN tunnel. All your ISP sees is that you are connected to the VPN server, but it does not know what you are doing specifically. Your ISP cannot target and throttle activities that it cannot see. NordVPN has deployed to date 3500+ VPN servers in 61 countries. However, not every one of those servers supports peer-to-peer (P2P) file-sharing activities. If you do not live in the same region as a P2P-supporting VPN server, you should connect to the P2P server that is closest to you. Note that if you connect to a non-P2P server and run a P2P application, you will be automatically rerouted to a P2P server based in Canada. The number of P2P-supporting servers and how well they span the globe will determine speed performance, a major factor for evaluating a VPN service. Only a part of the 3500 NordVPN servers, deployed in 19 countries including USA, are configured and optimized for P2P activities. NordVPN’s P2P network still has much room to expand. If you live outside its P2P network, you should actually test its performance before committing to a paid NordVPN plan. 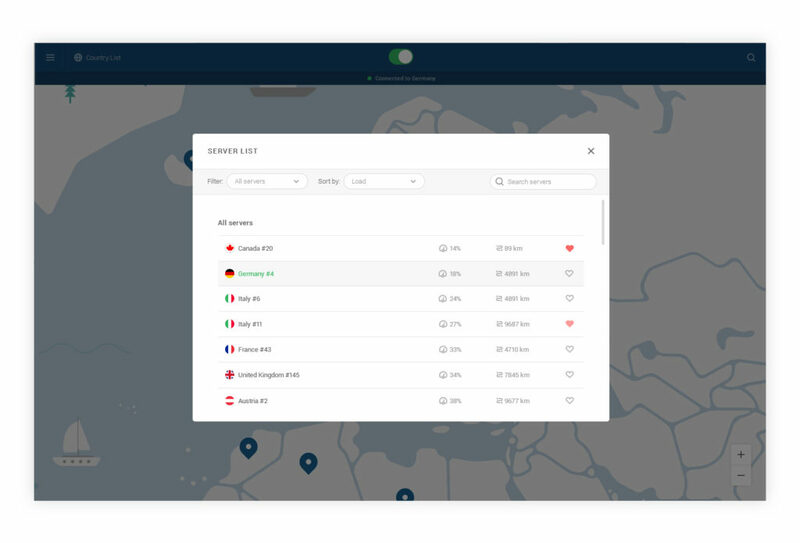 NordVPN offers a 3-day free trial. To request a free trial, email to support(at)nordvpn.com. If you are a heavy file-sharing user, there is another reason, besides bandwidth throttling, for looking into a VPN subscription. Namely, online privacy and anonymity. ISPs are, in general, averse to the copyright infringement risk that P2P applications post. They, as often required by law, keep a detailed log of your Internet activities, e.g., when and what websites you visit. By subscribing to a VPN service, all your Internet traffic is encrypted, and hence protected from the watchful eyes of your ISP. NordVPN takes this concept one step further: it offers the Double VPN feature. With a Double VPN, your traffic is rerouted to, not one VPN server, but two, each in a different country. Consequently, your traffic is encrypted, not once, but twice. It is like putting two locks on a door. One caveat with Double VPN is that you cannot arbitrarily choose any 2 of the 3500+ VPN servers in any 2 of the 61+ countries to use in your connection. The menu only has 7 combinations available for you to choose, e.g., USA-Canada, and Netherlands-United Kingdom. The other caveat is that encryption is a CPU-intensive activity, and double encryption means double the speed penalty. Data encryption protects your privacy and anonymity from your ISP. But, it is not enough. You must also be protected from the VPN service provider. NordVPN has a no-logging policy: it keeps no log of your Internet activities. It is very refreshing to read its Term of Use document and not find in the fine print any qualification or exception to the no-logging policy. Most VPN service providers allow you to connect up to 3 Internet devices to the VPN at the same time. NordVPN is more generous in allowing 6 devices. There is one catch though. To connect multiple devices to the same VPN server, you must choose a different VPN protocol for each connection. NordVPN supports a total of 4 VPN protocols: OpenVPN TCP, OpenVPN UDP, L2TP, and PPTP. So, you are essentially limited to connecting 4 devices to a single server at once. To connect 6 devices, a feasible workaround is that you connect 4 devices to one server, and 2 devices to another server. Their encrypted proxy extensions for Chrome and Firefox browsers is also a useful feature. NordVPN offers 3 regular paid subscription plans: 1-month, 6-months and 1-year plans. Their prices are competitive with the market. The 12-month plan costs $6.99 (USD) per month. All 3 plans come with a 30-day money-back guarantee, which is one of the most generous in the industry. Customers who subscribe for 2 years only pay $3.99 per month (66% Discount), which is extremely cheap for a quality VPN service. Also the service can be tested 3 days for free. When you connect to a NordVPN server, your Internet device takes on a dynamic server-specific IP address. The IP address is dynamic, meaning that it may differ from 1 VPN session to the next. Some VPN service providers argue that dynamic IP addressing provides better protection of online privacy. Nevertheless, some web applications may require users to have a dedicated IP address. NordVPN offers dedicated IP addresses as a paid feature. Note that this feature is only available for servers located in 3 countries (USA, Germany, and Netherlands). For $50 annually, your devices will be assigned a dedicated IP address that is geo-located in 1 of the 3 aforementioned countries. To pay for the services, you can use a major credit card, PayPal, or Bitcoin. The security conscious subscribers can anonymously purchase and pay for the service using Bitcoin. 24/7 help is available via email. Simultaneous connections of up to 6 devices. Only about 60% of all VPN servers are configured for P2P.